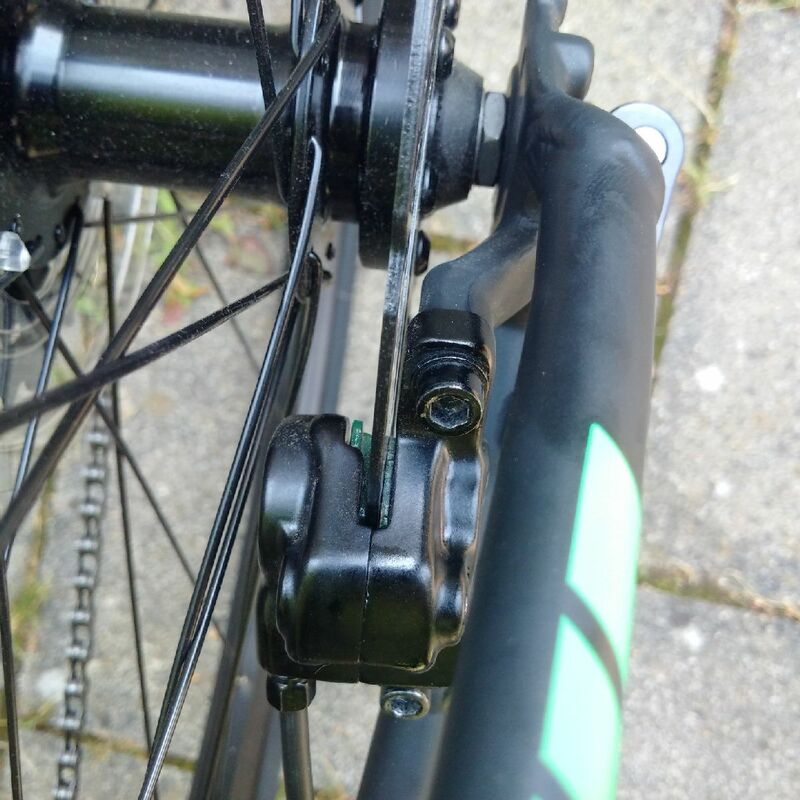 I have recently bought my first disk brake bike and after having the first ride, I noticed a slight rear disk brake rubbing noise. So, next day I decided to have a look and reposition the brake. Since, I've never dealt with disk brakes before I've unscrewed every possible screw and started "experimenting". (Yeah, very stupid of me). Eventually, I didn't manage to fix the noise and left the brakes lightly screwed when returning home. On the ride I tried to pull the rear break lever several times to check if I can still stop on such loose brakes. But after several tries the break lever became quite loose and lost pressure. When arrived I noticed oil everywhere... Can I fix it somehow? The liquid in the top photo is hydraulic fluid. You probably unscrewed the bleed port screw at some point and now your system has less fluid than it needs and also air. Seek a tutorial using your preferred search engine "bleed tektro brakes" on how to bleed your brakes and follow it. When you have done that you need to check two more things. There's no fluid on the pads. There's no fluid on the rotors. You'll know either of these things if after a successful bleed theres no braking power/friction even with the brakes jammed on hard. Clean rotors with isopropyl alcohol (not meths or petrol) and clean paper towels. Really bad contamination might require sanding the rotor with fine grain sandpaper too. Try isopropyl first. Contaminated pads should be replaced or if you cant afford to there's a hack which you really shouldn't do. Ventilate well. Wear something over your eyes. Place pads metal side down on a cold stove top element and then turn on the element. Wait for the element to heat up and the fluid will start burning off too. Once the fluid has burnt off (smoke stops) remove pads from element immediately with a tool. This will be in the order of less than 60 seconds. If a pad gets too hot it will crack and need to be thrown away. Don't turn the element on too hot. Allow pads to cool naturally. Clean pads with isopropyl. Not a specific answer but I feel I have to write this. So I guess you already realize, but disabling one of your bike's brakes and continuing to ride is a seriously bad idea that could result in injury or death. Apart from allowing the hydraulic fluid to leak out - which was bad enough, loosening the mounting bolts could have resulted in sudden catastrophic failure that could have damaged the rotor, caliper or frame. I suggest you have a bike repair shop sort this out for you to make sure the repairs are done properly. Not the answer you're looking for? Browse other questions tagged brakes shimano disc-brake hydraulic-disc-brake trek or ask your own question. 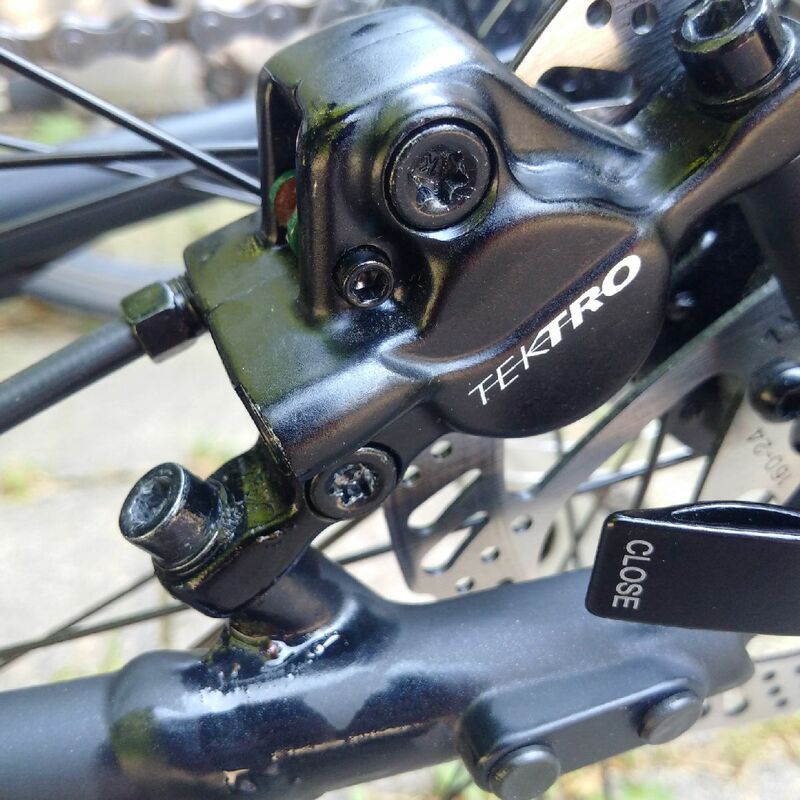 How often should hydraulic disk brakes need bleeding? How do I get rid of weird rubbing noise on my cx bike? Brakes won't release after being applied?